The Institute for Democratic Governance (IDEG) is proposing the establishment of an 11-member Local Development Advisory Council made up of chiefs and professional bodies, to oversee the activities of the local assemblies. But a governance expert, Dr Eric Osae, had a contrary opinion saying the position of the IDEG would undermine the authority of the assembly. He said the Council of State should rather be modified and mainstreamed into the country’s governance architecture to have full representation of chiefs to not only advise the President, but the Speaker of Parliament and even the Chief Justice. These varied views came to light when the IDEG organised a retreat to discuss the position and role of chiefs in a multi-party local government system in Accra on Wednesday. The three-day retreat of influential chiefs and queenmothers is to provide the platform for traditional authorities to contribute their views on the best way to enhance their participation in local governance. 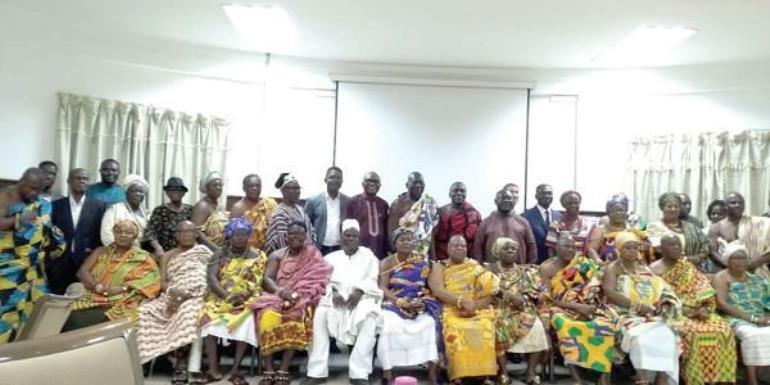 The meeting brought together about 20 influential chiefs and queenmothers from across the country to debate on the proposal by the chiefs and IDEG aimed at enhancing the participation of traditional authorities in local governance to promote sustainable and peaceful development at the local assemblies. The 70 per cent of the membership of the local assemblies is elected during the district assembly elections, while the 30 per cent is appointed by the government. However, the chiefs are advocating for a review, as the country prepares towards electing Municipal, Metropolitan and District Chief Executives in 2021. Article 276 (1) of the 1992 Constitution bars chiefs from taking part in active party politics and any chief seeking election would have to abdicate his stool or skin. However, the Constitution provides for traditional leaders to be appointed to public office positions. In recent times, The Member of Parliament for Talensi, Mr Robert Nachinab Doameng Mosore, stepped down in May 2015, after he was enskined Paramount Chief of Tongo in the Upper East Region. Prof. Nana S.K.B. Asante, who has advanced the proposal of the chiefs, said the institutional representation of the chiefs in the local assemblies could be achieved by allocating 30 per cent of the membership of the assemblies to traditional authorities. The Atwima Apemanimhene, Nana Fobi Kropa III, Prof. Kwasi Ansu-Kyeremeh, said Ghana’s chiefs had gone through a gradual process of marginalisation and exclusion from local government over the past century. He said the 30 per cent allocation should, therefore, be given to the chiefs, adding that “they should even be made the Presiding Members of the Assemblies”. Prof. Ansu-Kyeremeh, who is also a lecturer at the School of Communication aStudies the University of Ghana, said considering the fact that the chiefs were the immediate closest entities to the people, it was only fair that they were involved in local governance. While expressing concern about the marginalisation of the chiefs in development at the local level, he was of the view that there would be more and better development at the local levels if chiefs were made to run the affairs of the assemblies. “I have not been consulted by the district chief executive officer or any of the local authorities for the past 13 years on any important issue concerning my area. We are not regarded any more”, he said. The Paramount Chief of Anfoega Traditional Area, Togbe Tepre Hodo IV, said Chiefs needed to actively participate in local governance and therefore, the 30 per cent should be ceded to the chiefs. But a Senior Research Fellow with IDEG, Prof. Joseph Atsu Ayee, said chiefs used to have one third representation at the district assemblies in the past, but that was reversed due to the use of chieftaincy disputes to interfere and meddle in the affairs of local assemblies. He said the Local Development Advisory Council, which would be backed by law, would be non-partisan, neutral and an impartial body mainly comprising of chiefs and queenmothers to give chiefs the opportunity to participate in local governance. Instead of being part of the local assemblies where their authority might be undermined, he said the chiefs would bring to bear their wisdom, knowledge and experience on development, conflict resolution and cultural modernisation while represented on the council. Although chiefs were very influential and important in the Ghanaian community, and their inputs in local governance would go a long to enhance development, Prof Ayee said getting involved in the affairs of the assemblies could taint their authority. He further explained that the council would also include professional bodies such as lawyers, engineers and medical doctors among others to give their expertise on their area of work to promote development at the local levels. However, Dr Osae, who is also the Technical Advisor to the Ministry of Local Government and Rural Development, said chiefs were already integral part of the governance system because they were represented on the Council of State while the Regional Coordinating Council also made space for them. He said allocating the 30 per cent to the chiefs would undermine their authority and also setting up a Local Governance Advisory Council would also undermine the authority of the assemblies. Therefore, he suggested that the Council of State chamber be expanded to have a second chamber to include more chiefs and their mandate broadened to advise the Speaker of Parliament and the Chief Justice.